Hyperkinetic movement disorders may arise as isolated phenomena or be manifestations of a systemic disorder. The disorders discussed in this section present with diverse clinical findings, and vary in incidence from relatively common to extremely rare. There is only limited information available regarding the specific mechanisms underlying their development. This section will briefly describe the pertinent features of essential tremor, palatal tremor, tics, stiff-person syndrome, myoclonus, and isolated muscle spasm. An organized, methodical search for characteristic features of these disorders will facilitate an accurate clinical diagnosis and support identification of an appropriate treatment option. For some of these conditions, injection of botulinum toxin into involved muscles may be considered as an effective adjunct to standard medical therapies. This activity is directed to neurologists, family practitioners, plastic surgeons, physiatrists, physical therapists, speech and language pathologists, and other healthcare providers involved in the treatment of other hyperkinetic movement disorders using neurotoxin therapy. April 2011 through April 2013. Original Release Date: April 2011. Tremor is an involuntary rhythmic, repetitive movement of a body part. It is usually described clinically by whether it occurs at rest or during action. Tremor may be further defined by other criteria relevant to research or epidemiological study, such as severity or periodicity.1 The degree of disability associated with tremor depends upon the anatomical target (e.g., head, hands, lower extremities), the frequency of oscillation, and the distance traversed by the affected part during each cycle. Tremor may range from trivial motion unreported by an individual to coarse, rhythmic excursions causing profound social and functional impairment. Standardized diagnostic criteria for definite ET have been developed (Table 1).3 History and thorough physical exam will generally suffice for the diagnosis, so laboratory and advanced imaging or neurophysiological studies are not typically needed in most patients unless there is sufficient concern to exclude other conditions known to be associated with tremor (e.g., Wilson’s disease, thyroid conditions).3 Patients with tremor due to other disorders might display additional symptoms consistent with an alternative diagnosis. Specialist referral should be considered in all unclear or complicated cases. Care should be taken to prevent misdiagnosis of Parkinson’s disease in a patient with ET. Even though the differentiation of ET from Parkinson’s disease may initially appear straightforward, such as absence of bradykinesia and mask-like facies, the distinction can be challenging when a patient with classical postural-action tremor displays rest tremor, which is more likely to occur in patients who have had longstanding, severe disease.12 Depending upon the clinical locale, an estimated 30% to 50% of patients with ET are initially misdiagnosed with Parkinson’s disease or other tremor disorder.13, 14 Dystonic tremor can also be difficult to distinguish from ET, particularly in regard to head tremor. *CRS = Clinical Rating Scale, as follows: A: Established as effective, ineffective, or harmful for the given condition in the specified population. (Level A rating requires at least two consistent Class I studies.) B: Probably effective, ineffective, or harmful for the given condition in the specified population. (Level B rating requires at least one Class I study or at least two consistent Class II studies.) C: Possibly effective, ineffective, or harmful for the given condition in the specified population. (Level C rating requires at least one Class II study or two consistent Class III studies.) U: Data inadequate or conflicting given current knowledge, treatment is unproven. * *Adverse events severity: mild = somewhat bothersome, moderate = very bothersome, severe = potentially harmful to patients. Intramuscular injections of BoNT can reduce tremor. Studies have shown variable improvement in function, as moderate hand and finger weakness is a common side effect. 1. Deuschl G, Bain P, Brin M. Consensus statement of the Movement Disorder Society on Tremor. Ad Hoc Scientific Committee. Mov Disord 1998;13 Suppl 3: 2-23. 2.Jankovic J. Treatment of hyperkinetic movement disorders. Lancet Neurol 2009;8(9): 844-56. 3. Benito-Leon J, Louis ED. Essential tremor: emerging views of a common disorder. Nat Clin Pract Neurol 2006;2(12): 666-78; quiz 2p following 91. 4. Lorenz D, Schwieger D, Moises H, Deuschl G. Quality of life and personality in essential tremor patients. Mov Disord 2006;21(8): 1114-8. 5. Kumar N, Greenlund A. Tremor and other involuntary movements. Available from URL: http: //www.aan.com/go/education/curricula/internal/chapter9 [accessed August 29, 2010]. 6. Brin MF, Koller W. Epidemiology and genetics of essential tremor. Mov Disord 1998;13 Suppl 3: 55-63. 7. Dogu O, Sevim S, Camdeviren H, et al. Prevalence of essential tremor: door-to-door neurologic exams in Mersin Province, Turkey. Neurology 2003;61(12): 1804-6. 8. Rautakorpi I, Takala J, Marttila RJ, Sievers K, Rinne UK. Essential tremor in a Finnish population. Acta Neurol Scand 1982;66(1): 58-67. 9. 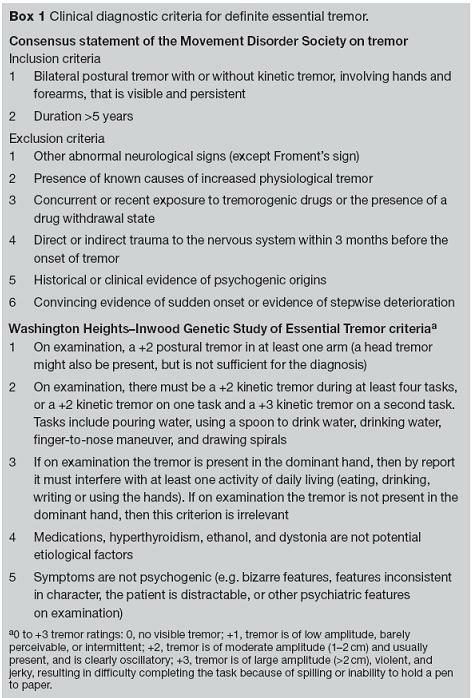 Deng H, Le W, Jankovic J. Genetics of essential tremor. Brain 2007;130(Pt 6): 1456-64. 10. Louis ED. Environmental epidemiology of essential tremor. Neuroepidemiology 2008;31(3): 139-49. 11. Hallett M. Overview of human tremor physiology. Mov Disord 1998;13 Suppl 3: 43-8. 12. Louis ED. Essential tremor. Lancet Neurol 2005;4(2): 100-10. 13. Benito-Leon J, Louis ED. Clinical update: diagnosis and treatment of essential tremor. Lancet 2007;369(9568): 1152-4. 14. Meara J, Bhowmick BK, Hobson P. Accuracy of diagnosis in patients with presumed Parkinson's disease. Age Ageing 1999;28(2): 99-102. 15. Zesiewicz TA, Elble R, Louis ED, et al. Practice parameter: therapies for essential tremor: report of the Quality Standards Subcommittee of the American Academy of Neurology. Neurology 2005;64(12): 2008-20. 16. Serrano-Duenas M. Use of primidone in low doses (250 mg/day) versus high doses (750 mg/day) in the management of essential tremor. Double-blind comparative study with one-year follow-up. Parkinsonism Relat Disord 2003;10(1): 29-33. 17. Brin MF, Lyons KE, Doucette J, et al. A randomized, double masked, controlled trial of botulinum toxin type A in essential hand tremor. Neurology 2001;56(11): 1523-8. 18. Wissel J, Masuhr F, Schelosky L, Ebersbach G, Poewe W. Quantitative assessment of botulinum toxin treatment in 43 patients with head tremor. Mov Disord 1997;12(5): 722-6. PT is a very rare movement disorder, and only limited information regarding its prevalence and demographics is known. In a recent small series of children with EPT, the age of onset was between 6 and 7 years (consistent with historical reports), and the majority of children were boys.2 Another review of 103 cases, including pre-1900 reports, concluded that the male:female ratio for EPT is 1:1, with an age of onset ranging from 4 to 74 years. No specific concurrent features or predisposing elements were identified.3 The prevalence of SPT is unknown. Figure 3.Symptomatic palatal tremor (SPT) and hypertrophic degeneration of the inferior olive. Axial sections of the brainstem and cerebellum in a patient with palatal tremor and multiple neurological deficits (SPT). These sections demonstrate hypertrophic degeneration of the olive, seen as a hyperintense, oval structure on the right side of the medulla. The hypertrophied inferior olive is proposed to be the pacemaker of tremor in this form of the syndrome. No hypertrophic degeneration is demonstrated for EPT. Reprinted from Deuschl.1 Permission pending. Palatal movements rarely bring a patient to medical attention. The rhythmic movements of the soft palate in SPT will be discovered during examination of neurologically impaired patients who present with a spectrum of associated clinical findings, including nystagmus or other sign of bulbar involvement, ataxia, and hemiparesis, which are consistent with a predisposing neurological lesion. Figure 4. Ear EPT: Relationship of palatal muscles and eustachian tube. Coronal section of human fetal head taken through the velum at the plane of the eustachian tube opening into the pharynx (1). The eustachian tube (2) is one tether of the tensor veli palatini (3), which is the muscle involved in essential palatal tremor. A defining characteristic of EPT is an audible click in the ear, heard not only by the patient but by the examiner. The click is thought to arise through rapid changes in surface tension across the eustachian tube consequent to repetitive contraction of the muscle. 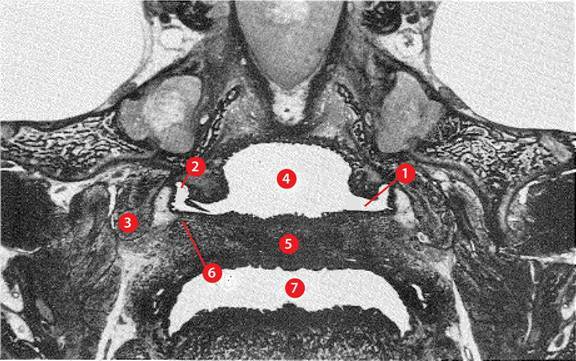 Other features depicted here include (4) lumen of nasopharynx, (5) velum of the palate, (6) levator veli palatini, and (7) oral cavity. Reprinted from Dickson.6 Permission pending. The observed tremor in EPT is typically bilateral because of the existence of a small aponeurosis connecting the tensor muscle to palatal hamuli on both sides. SPT in theory may manifest as unilateral tremor if the amplitude of ipsilateral muscle contraction is sufficiently high. In series, however, all patients have bilateral tremor regardless of the syndrome, as mechanical factors related to insertions and fibrous connections override neuroinnervation.7 As a practical matter, laterality of the tremor is not crucial to formulating a diagnosis given other differentiating features. No specific diagnostic tests have been developed for palatal tremor. Advanced imaging for EPT is not necessary, whereas imaging for SPT should reveal stigmata of the lesion and hypertrophic degeneration of the olive. Treatment is usually based on anticonvulsants and sedatives. No medication has proven reliably effective. BoNT serotypes A and B (BoNT-A and BoNT-B) have been used successfully in the treatment of EPT, with much of this success noted in case reports lacking long-term follow-up. However, notable studies enrolling series of patients have emerged that clearly demonstrate effective and safe treatment of both EPT and SPT with the BoNT-A formulations onabotulinumtoxinA and abobotulinumtoxinA and the BoNT-B formulation rimabotulinumtoxinB. In one of the largest single EPT series reported in the literature, abobotulinumtoxinA treatment was offered to adult patients presenting with audible ear clicks and PT. No intrinsic neuropathology was discovered on examination or MRI. Of 10 patients offered abobotulinumtoxinA treatment, five accepted. The five patients who declined treatment remained available to follow-up. Treatment was initiated with 5 to15 units of abobotulinumtoxinA to the affected side, with the larger doses providing greater symptom control. One patient reported complete resolution after the first injection, and three others reported complete resolution after the second injection. One patient reported only moderate symptomatic improvement. The duration of resolution in patients with complete responses varied from 2 to 6 months. One patient reported transient side effects of difficulty swallowing, change in voice quality, and velopharyngeal insufficiency.8 No cases of spontaneous resolution were reported among patients who declined intervention. In another series evaluating differences in BoNT (mostly abobotulinumtoxinA, but one patient received an initial injection of onabotulinumtoxinA), treatment outcome in three adults and two children with EPT, four of five subjects (including both children) demonstrated full resolution of symptoms 2-5 days postinjection and one patient reported a partial response. A total of 11 injections were performed. The duration of response in adult patients was between 4 and 32 weeks (mean, 20 weeks). The response in children included that of a 10-year-old girl who demonstrated complete resolution within 3 days of the first injection with no recurrence through almost 4 years of follow-up. (This, of course, might indicate that the disorder was psychogenic.) The second child, age 6, was symptom free for 24 weeks following the first injection; after recurrence and a second injection, he had been symptom free for nearly 2 years at the time the report was published. Adverse events in the group were mild and transient.9 A notable aspect of this report is the inclusion of a 6-year-old child; as of 2008, the youngest child documented to receive BoNT had been 8 years old, and that child experienced severe, complete palatal palsy following a second injection with a possibly excessive dose. He required hospitalization and nasogastric feeding for 3 weeks before recovering completely.10 Dosages of BoNT may need to be reduced in repeat-dose scenarios; this issue requires further study. 2. Campistol-Plana J, Majumdar A, Fernandez-Alvarez E. Palatal tremor in childhood: clinical and therapeutic considerations. Dev Med Child Neurol 2006;48(12): 982-4. 3. Zadikoff C, Lang AE, Klein C. The 'essentials' of essential palatal tremor: a reappraisal of the nosology. Brain 2006;129(Pt 4): 832-40. 4. Deuschl G, Toro C, Valls-Sole J, Zeffiro T, Zee DS, Hallett M. Symptomatic and essential palatal tremor. 1. Clinical, physiological and MRI analysis. Brain 1994;117 ( Pt 4): 775-88. 5. Deuschl G, Jost S, Schumacher M. Symptomatic palatal tremor is associated with signs of cerebellar dysfunction. J Neurol 1996;243(7): 553-6. 6. Dickson DR. Normal and cleft palate anatomy. Cleft Palate J 1972;9: 280-93. 7. Deuschl G, Toro C, Hallett M. Symptomatic and essential palatal tremor. 2. Differences of palatal movements. Mov Disord 1994;9(6): 676-8. 8. Penney SE, Bruce IA, Saeed SR. Botulinum toxin is effective and safe for palatal tremor: a report of five cases and a review of the literature. J Neurol 2006;253(7): 857-60. 9. Krause E, Heinen F, Gurkov R. Difference in outcome of botulinum toxin treatment of essential palatal tremor in children and adults. Am J Otolaryngol 2010;31(2): 91-5. 10. Pal PK, Lakshmi PS, Nirmala M. Efficacy and complication of botulinum toxin injection in palatal myoclonus: experience from a patient. Mov Disord 2007;22(10): 1484-6. Note: Manifestations of tic disorders may wax and wane over time; consequently, the diagnosis of a primary tic disorder may require prolonged surveillance period. Tourette syndrome (TS; also called Tourette disorder) is the most well-known and best described primary tic disorder. The disorder appears to be hereditary for most patients and manifests with a wide array of motor and phonic tics. TS is the most common cause of chronic tics, with an overall worldwide prevalence of 1%.3, 5 As with other tic disorders, the prevalence of TS rises markedly in special education populations, healthcare-facility and group-home residents, and specialty-referral practices. TS arises in childhood, affecting male subjects approximately three times as frequently as female subjects.2 Tics usually present between 3 and 8 years of age, and more than 96% of patients with TS are identified by age 11 years.2 TS is closely associated with a psychiatric comorbidity, such as attention-deficit and obsessive-compulsive disorders (OCDs).2 Obsessive-compulsive behaviors occur in about 20% to 60% of patients with TS, with some studies reporting them in up to 89%.12 Although TS appears to have a strong hereditary predisposition, the search for specific genes has been unrewarding. Tics are distinguished by their stereotypic quality, suppressibility, and associated urge.1 Most primary tics are mild, transient, and present for less than 12 months.12 Those that do not meet those criteria are likely to be part of the spectrum of TS or some other disorder. Because tic manifestations may fluctuate widely over time or become quiescent with growth and maturity, determining which tics are harbingers of a chronic tic disorder and which will be shown with the passage of time to have been transient phenomena can be challenging for the physician and stressful for patients and families. For that reason most diagnoses of TS are retrospective: given the absence of definitive biomarkers, imaging, or other findings pathognomonic for TS, there is no way to predict whether tics will resolve within months, become multiple, or become chronic.12 Familiarity with the range of conditions, pharmacological therapies, or syndromes of toxicity presented in Table 3 may suggest an etiology for tics or stimulate a careful assessment for motor and phonic tics executed as part of the secondary disease process. Reprinted from the Diagnostic and Statistical Manual of Mental Disorders, 4th ed, Text Revision. American Psychiatric Association, 2000. Permission pending. B. The tics occur many times a day, nearly every day, or intermittently throughout a period of more than 1 year, and during this period there was never a tic-free period of more than 3 consecutive months. D. The disturbance is not due to the direct physiological effects of a substance (e.g., stimulants) or a general medical condition (e.g., Huntington’s disease or postviral; encephalitits). E. Criteria have never been met for Tourette’s Disorder. D. The disturbance is not due to the direct physiological effects of a substance (e.g., stimulants) or a general medical condition (e.g., Huntington’s disease or postviral encephalitis). E. Criteria have never been met for Tourette’s Disorder or Chronic Motor or Vocal Tic Disorder. Reprinted from the Diagnostic and Statistical Manual of Mental Disorders, 4th ed, Text Revision/ © 2000, American Psychiatric Association. Permission pending. Tic-suppressing therapy should be considered for those patients whose tics are causing clear psychosocial distress (peer problems, academic or work difficulties, or family and social disruption) or musculoskeletal problems (injury or chronic pain). The presence of one or more tics is not sufficient indication for tic-suppressive therapy in the absence of compelling evidence supporting social or functional disability. Biofeedback, relaxation methods, and other behavioral techniques may be helpful in alleviating stress that potentially aggravates tics. Individualized academic, vocational, social, or other supportive services may also prove beneficial. It is fair to say that the data for BoNT therapy about tic, overall, is rather limited, and that it is not widely used. 1. Kumar N, Greenlund A. Tremor and other involuntary movements. Available from URL: http: //www.aan.com/go/education/curricula/internal/chapter9 [accessed August 29, 2010]. 2. Jankovic J. Tourette's syndrome. N Engl J Med 2001;345(16): 1184-92. 3. Jankovic J, Fahn S. The phenomenology of tics. Mov Disord 1986;1(1): 17-26. 4. Jankovic J. Tourette syndrome. Phenomenology and classification of tics. Neurol Clin 1997;15(2): 267-75. 5. Robertson MM. The prevalence and epidemiology of Gilles de la Tourette syndrome. Part 1: the epidemiological and prevalence studies. J Psychosom Res 2008;65(5): 461-72. 6. Khalifa N, von Knorring AL. Prevalence of tic disorders and Tourette syndrome in a Swedish school population. Dev Med Child Neurol 2003;45(5): 315-9. 7. Khalifa N, von Knorring AL. Tourette syndrome and other tic disorders in a total population of children: clinical assessment and background. Acta Paediatr 2005;94(11): 1608-14. 8. Wenning GK, Kiechl S, Seppi K, et al. Prevalence of movement disorders in men and women aged 50-89 years (Bruneck Study cohort): a population-based study. Lancet Neurol 2005;4(12): 815-20. 9. Mason A, Banerjee S, Eapen V, Zeitlin H, Robertson MM. The prevalence of Tourette syndrome in a mainstream school population. Dev Med Child Neurol 1998;40(5): 292-6. 10. Robertson MM, Eapen V, Cavanna AE. The international prevalence, epidemiology, and clinical phenomenology of Tourette syndrome: a cross-cultural perspective. J Psychosom Res 2009;67(6): 475-83. 11. Eapen V, Lees AJ, Lakke JP, Trimble MR, Robertson MM. Adult-onset tic disorders. Mov Disord 2002;17(4): 735-40. 12. Singer HS. 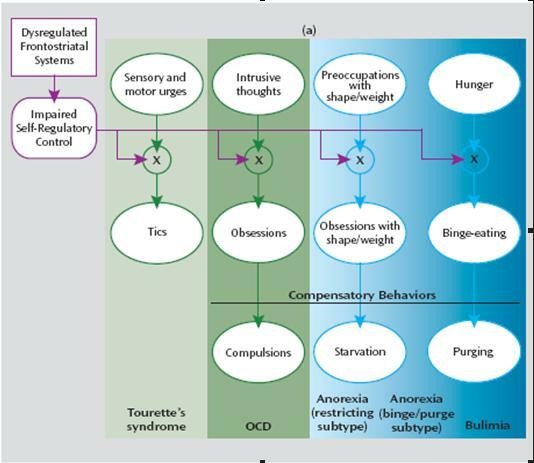 Tourette's syndrome: from behaviour to biology. Lancet Neurol 2005;4(3): 149-59. 13. Bohlhalter S, Goldfine A, Matteson S, et al. Neural correlates of tic generation in Tourette syndrome: an event-related functional MRI study. Brain 2006;129(Pt 8): 2029-37. 14. Marsh R, Maia TV, Peterson BS. Functional disturbances within frontostriatal circuits across multiple childhood psychopathologies. Am J Psychiatry 2009;166(6): 664-74. 15. Diagnostic and Statistical Manual of Mental Disorders, 4th ed. American Psychiatric Association, 2000. 16. Kompoliti K, Goetz CG. Hyperkinetic movement disorders misdiagnosed as tics in Gilles de la Tourette syndrome. Mov Disord 1998;13(3): 477-80. 17. Leckman JF. Phenomenology of tics and natural history of tic disorders. Brain Dev 2003;25 Suppl 1: S24-8. 18.Jankovic J. Treatment of hyperkinetic movement disorders. Lancet Neurol 2009;8(9): 844-56. 19. Shprecher D, Kurlan R. The management of tics. Mov Disord 2009;24(1): 15-24. 20. Bestha DP, Jeevarakshagan S, Madaan V. Management of tics and Tourette's disorder: an update. Expert Opin Pharmacother 2010;11(11): 1813-22. 21. Marras C, Andrews D, Sime E, Lang AE. Botulinum toxin for simple motor tics: a randomized, double-blind, controlled clinical trial. Neurology 2001;56(5): 605-10. 22. Jankovic J. Botulinum toxin in the treatment of dystonic tics. Mov Disord 1994;9(3): 347-9. 23. Kwak CH, Hanna PA, Jankovic J. Botulinum toxin in the treatment of tics. Arch Neurol 2000;57(8): 1190-3. 24. Salloway S, Stewart CF, Israeli L, et al. Botulinum toxin for refractory vocal tics. Mov Disord 1996;11(6): 746-8. 25. Scott BL, Jankovic J, Donovan DT. Botulinum toxin injection into vocal cord in the treatment of malignant coprolalia associated with Tourette's syndrome. Mov Disord 1996;11(4): 431-3. 26. Trimble MR, Whurr R, Brookes G, Robertson MM. Vocal tics in Gilles de la Tourette syndrome treated with botulinum toxin injections. Mov Disord 1998;13(3): 617-9. Stiff-person syndrome (SPS) is an uncommon, progressive motor disorder characterized by marked muscle stiffness in axial and appendicular muscles, lumbar hyperlordosis, and episodic, painful spasms. SPS may present as a primary disorder, or it may be secondary to other conditions, most notably neoplasia. The precise mechanism is unknown, but there is good evidence to support an autoimmune etiology. Figure 7. 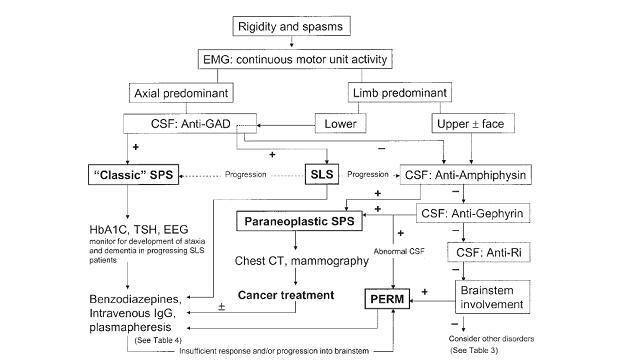 Algorithm for diagnosis and initial management of patients with presumed stiff-person syndrome (SPS). CT = computed tomography; CSF = cerebrospinal fluid; EEG = electroencephalogram (to screen for SPS comorbidities); EMG = electromyography; GAD = glutamic acid decarboxylase; HbA1C = hemoglobin A1C; PERM = progressive encephalomyelitis with rigidity and myoclonus; SLS = stiff-limb syndrome; TSH = thyroid-stimulating hormone. The PERM variant can arise in either axial or limb-predominant forms. Comorbid diabetes, thyroid disease, and epilepsy have not been reported in association with SLS. Reprinted from Espay.3 Permission pending. Liguori et al reported on two bedridden SPS patients who demonstrated bilateral improvement of rigidity and spasm by the tenth day following unilateral injection of 700 to 1000 U of abobotulinumtoxinA. The mechanism for this is unclear but presumably could involve hematogenous spread. 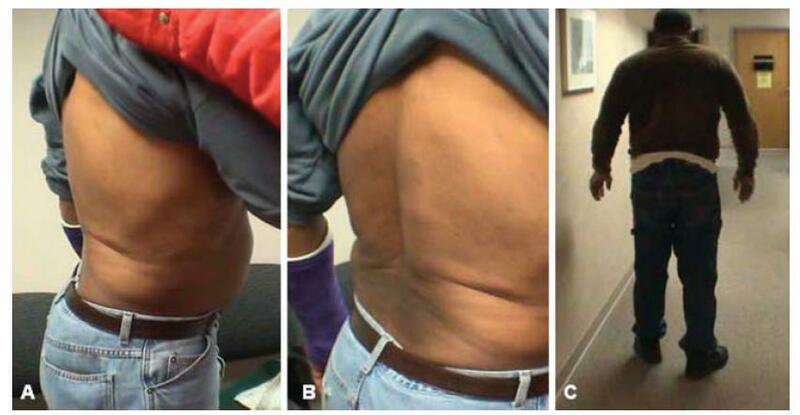 Improvement following a second unilateral injection administered to muscle targets on the side not previously injected resulted in complete cessation of painful spasms and markedly decreased tone.7 BoNT would not be considered first-line therapy in this condition. 1. Lockman J, Burns TM. Stiff-person syndrome. Curr Treat Options Neurol 2007;9(3): 234-40. 2. Levy LM, Levy-Reis I, Fujii M, Dalakas MC. Brain gamma-aminobutyric acid changes in stiff-person syndrome. Arch Neurol 2005;62(6): 970-4. 3. Espay AJ, Chen R. Rigidity and spasms from autoimmune encephalomyelopathies: stiff-person syndrome. Muscle Nerve 2006;34(6): 677-90. 4. Dalakas MC. Stiff person syndrome: advances in pathogenesis and therapeutic interventions. Curr Treat Options Neurol 2009;11(2): 102-10. 5. Ameli R, Snow J, Rakocevic G, Dalakas MC. A neuropsychological assessment of phobias in patients with stiff person syndrome. Neurology 2005;64(11): 1961-3. 6. Davis D, Jabbari B. Significant improvement of stiff-person syndrome after paraspinal injection of botulinum toxin A. Mov Disord 1993;8(3): 371-3. 7. Liguori R, Cordivari C, Lugaresi E, Montagna P. Botulinum toxin A improves muscle spasms and rigidity in stiff-person syndrome. Mov Disord 1997;12(6): 1060-3. Symptomatic myoclonus is characterized by the presence of involuntary jerking in the context of an associated nonepileptic central nervous system disorder. Symptoms are secondary to a provocative factor and may be progressive. Encephalopathy may be present, as with asterixis and hepatic disease. 1. Caviness JN. Myoclonus. Mayo Clin Proc 1996;71(7): 679-88. 2. Chang VC, Frucht SJ. Myoclonus. Curr Treat Options Neurol 2008;10(3): 222-9. 3. Caviness JN, Alving LI, Maraganore DM, Black RA, McDonnell SK, Rocca WA. The incidence and prevalence of myoclonus in Olmsted County, Minnesota. Mayo Clin Proc 1999;74(6): 565-9. 4. Caviness JN, Brown P. Myoclonus: current concepts and recent advances. Lancet Neurol 2004;3(10): 598-607. 5. Agarwal P, Frucht SJ. Myoclonus. Curr Opin Neurol 2003;16(4): 515-21. 6. Lagueny A, Tison F, Burbaud P, Le Masson G, Kien P. Stimulus-sensitive spinal segmental myoclonus improved with injections of botulinum toxin type A. Mov Disord 1999;14(1): 182-5. 7. Polo KB, Jabbari B. Effectiveness of botulinum toxin type A against painful limb myoclonus of spinal cord origin. Mov Disord 1994;9(2): 233-5. 8. Godeiro-Junior C, Felicio AC, Felix EP, et al. Moving ear syndrome: the role of botulinum toxin. Mov Disord 2008;23(1): 122-4. 9. Browner N, Azher SN, Jankovic J. Botulinum toxin treatment of facial myoclonus in suspected Rasmussen encephalitis. Mov Disord 2006;21(9): 1500-2. Note is made in this section of benefits reported for BoNT in the management of severe, isolated spasms or neuromyotonia affecting various body sites. These are idiosyncratic conditions, and no common mechanisms are proposed. All were chronic conditions intractable to medical management. It is important to recognize that the benefits associated with BoNT in some of these difficult cases endured for clinically meaningful periods, allowing the patients a period of improved function. Data are presented in Table 9. Abdominal movements improved, not eliminated. Pain remained prominent. 1. Hobson DE, Kerr P, Hobson S. Successful use of botulinum toxin for post-irradiation unilateral jaw neuromyotonia. Parkinsonism Relat Disord 2009;15(8): 617-8. 2. Lim EC, Seet RC. Botulinum toxin injections to treat belly dancer's dyskinesia. Mov Disord 2009;24(9): 1401. 3. Aburahma SK, Al-Khateeb T, Alrefai A, Amarin Z. Botulinum toxin A injections for the treatment of Schwartz-Jampel syndrome: a case series. J Child Neurol 2009;24(1): 5-8. 4. Joyce MB, de Chalain TM. Treatment of recalcitrant idiopathic muscular torticollis in infants with botulinum toxin type a. J Craniofac Surg 2005;16(2): 321-7. 5. Kern U, Martin C, Scheicher S, Muller H. Effects of botulinum toxin type B on stump pain and involuntary movements of the stump. Am J Phys Med Rehabil 2004;83(5): 396-9. 6. Sedano MJ, Trejo JM, Macarron JL, Polo JM, Berciano J, Calleja J. Continuous facial myokymia in multiple sclerosis: treatment with botulinum toxin. Eur Neurol 2000;43(3): 137-40. 7. Schwartz MS, Wren DR, Filshie J. Neuromyotonia in a muscle flap producing a convulsing breast: successful treatment with botulinum toxin. Mov Disord 1998;13(1): 188-90. 8. Bertolasi L, Priori A, Tomelleri G, et al. Botulinum toxin treatment of muscle cramps: a clinical and neurophysiological study. Ann Neurol 1997;41(2): 181-6. 9. Lou JS, Pleninger P, Kurlan R. Botulinum toxin A is effective in treating trismus associated with postradiation myokymia and muscle spasm. Mov Disord 1995;10(5): 680-1.